A simple puncture is something that’s a pretty easy fix. 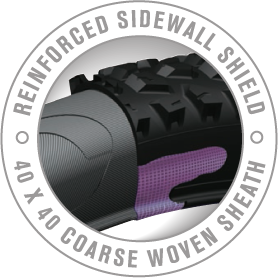 But a slashed or ruptured sidewall often results in a long walk or a call for rescue. Velowürks Advanced Sidewall protection laminates an extra tough layer of high density nylon along the entire sidewall from bead to tread to resist tears and abrasions from rocks, roots and other nasties while providing more sidewall support and helping prevent sealant loss.